In my classroom you would expect to see a range of pedagogical styles in action with enquiry based learning at its heart. Students are often required to build their understanding from a range of experiences. My role as a MYP science moderator also keeps me aligned with how assessment tasks need to be designed to allow students the opportunities to shine against the relevant criterion. As a leading MYP teacher at my school I also recognise the importance to students and the shared responsibilities of teachers with the approaches to learning (AtL) skills. The Human Ingenuity challenges were introduced to excite students about the opportunities of science and provide all students with an opportunity to succeed. 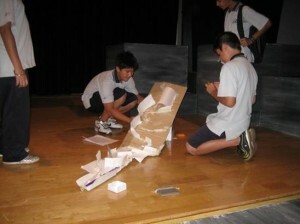 Teams of student complete a long-term project (For example the Galympics). All of the competing teams have a full day of timetable to present their long-term projects and also a number of spontaneous challenges. This unit has been designed to help prepare students make informed decisions relating to car health and safety in the future. The key concepts behind the graphical presentation of motion, Newton’s 3 laws and the equations of motion will be introduced. Speed limits, stopping distances and drink driving are some of the the applications used. Safety features are then considered and evaluated in the production of a criterion D leaflet on a car safety feature. A scientific investigation will take place considering collisions and will be used to assess criteria B (Inquiring and designing) and C (Processing and evaluating) . The unit culminates with a car safety test to assess criterion A (Knowing and Understanding). This unit has been designed for students to relate our world’s energy needs with climate change and to consider future options to reduce this impact. Students will be required to write a proposal for an alternative energy solution for a specific country and the climate change issues that they are facing, which will be used to assess criterion D. The unit culminates in a test which will be used to assess criterion A. Outside of school hours my classroom is still a hub of exploration hosting the Mad Scientist club and supporting students involved in the Spaghetti Machine competition set by the University of Melbourne. Check this link to see how the Dream Team constructed a Rube-Goldberg style machine designed to play a CD, which they received highly recommended notoriety.